…and through Him to reconcile all things to Himself, having made peace through the blood of His cross; through Him, I say, whether things on earth or things in heaven. And although you were formerly alienated and hostile in mind, engaged in evil deeds, yet He has now reconciled you in His fleshly body through death, in order to present you before Him holy and blameless and beyond reproach (Col 1:20-22). Jesus has reconciled only a certain, select group of people, according to what most of us have believed, in order to present us blameless and beyond reproach. We have limited the scope of this reconciliation, thinking it could not possibly include everyone and everything. Inevitably, different groups have had different opinions about who is in and who is out. Everyone and everything is included. Jesus reconciled all things to Himself. If Jesus did it already, no one needs to do anything more. 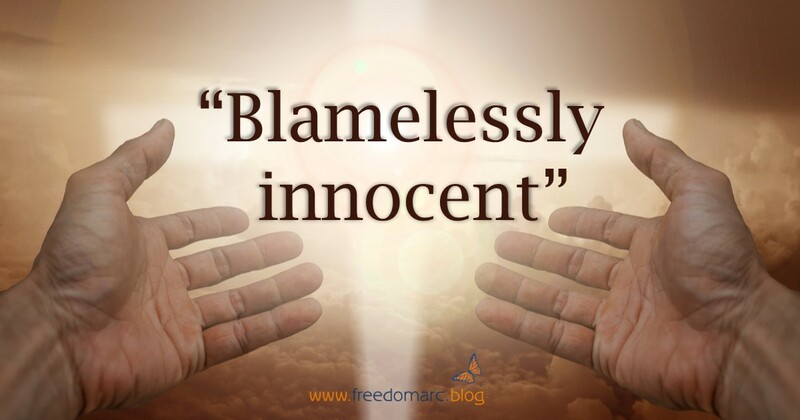 There is nothing we can do to make ourselves holy and blameless and beyond reproach because He already did it. He died our death, dealt with our separation and brought us back into a restored relationship. …namely, that God was in Christ reconciling the world (Greek: kosmos) to Himself, not counting their sins against them, and He has committed to us the word of reconciliation (2 Cor 5:19). God is not counting anyone’s sins against them. That is forgiveness. Psalm 103 tells us that as far as the east is from the west, so far has He removed our transgressions from us. No matter how far you travel trying to find them, you never will. Vine’s dictionary will tell you that kosmos means ‘the sum-total of human life in the ordered universe, considered apart from, and alienated from, and hostile to God, and of the earthly things which seduce from God.’ Even if you believe that, the kosmos is what ‘God so loved’ in John 3:16 and what ‘God was in Christ reconciling’ in 2 Cor 5:19. It has all been reconciled. We have this word, that Jesus has reconciled everyone, but what have we done with it? Have we shared with people the good news of what God has done for them, or bad news, that they are not reconciled with, and still separated from, a God who doesn’t even like them? For the wages of sin is death, but the free gift of God is age-enduring life in Christ Jesus our Lord (Rom 6:23). Jesus died our death and now there is no longer any sin, and therefore no wages due. If no one’s sin is counted against them, based on the power of the cross, then all subsequent judgments must produce life and not death. As Francois Du Toit says in the Mirror Bible translation of 2 Cor 5:19, “the fallen state of mankind was deleted.” There is no double jeopardy in God’s kingdom: you cannot be tried for the same thing twice. No one can be judged again for what Jesus already died for. The cross is the final judgment. There is no future ‘judgment day’: it already happened at the cross and we have all been declared blamelessly innocent. Sadly, we judge people all the time, based on their behaviour and what we consider to be right or wrong rather than looking at them in love through the eyes of Jesus. We do not necessarily condone everyone’s behaviour, but we need to be careful not to think that it excludes them from God’s love and reconciliation. But when God, who had set me apart even from my mother’s womb and called me through His grace, was pleased to reveal His Son in me so that I might preach Him among the Gentiles… (Gal 1:15-16). He does not say that God revealed His Son in the bright light that blinded him, but that “God was pleased to reveal His Son in me”. God had been at work in him all along; Jesus had been in Him all along; now God revealed that to him. God is not separated from people, even from someone like Saul who was implacably opposed to Him. He is at work in all people to reveal Himself as love and light – and through them to others. For too long the good news has been presented something like this: “There is a big gulf between you on one side and God on the other. The cross bridges the gap and you can walk across that bridge and engage God.” The real good news is that there is no gulf. God is already at work in everybody, and our job is to help them see that (not to tell them that they are dirty, rotten sinners who deserve to suffer eternal conscious torment as their punishment in hell). There is no separation. Let us not imagine that the incarnation separated Father, Son and Spirit; nor even the crucifixion. Scripture tells us that all the fullness of God’s being dwells bodily in Christ (Col 2:9) and that God was in Christ, reconciling the world to Himself (2 Cor 5:19). On the cross, Jesus felt the agony of fallen humanity when he quoted the opening line of Psalm 22, “My God, my God, why have you forsaken me?” But every Jewish person who heard Him knew where the Psalm was going, with David crying triumphantly “He has not despised or abhorred the affliction of the afflicted; and he has not hid his face from him but has heard when he cried to him.” (Ps 22:24). The restoration of all things is based on the victory of the cross over all things that would hinder our reconciliation and restoration to relationship. All judgment and justice are based on the victory of the cross over sin, death and the grave; every hindrance or legal obstacle is overcome. Jesus holds the keys of death and of Hades (Rev 1:17) and He is using them to unlock the door, not lock it. That is totally contradictory to some of our belief systems. God has opened access to everyone. The gates of the New Jerusalem are never shut. Everyone is included, no one excluded. …so that, as sin reigned in death, even so grace would reign through righteousness to age-enduring life through Jesus Christ our Lord (Rom 5:21). The power of the resurrection has defeated death (and it is what enables everything to be restored). The resurrection has overcome death and grace now reigns. For since by a man came death, by a man also came the resurrection of the dead. For as in Adam all die, so also in Christ all will be made alive (1 Cor 15:21-22). Take note of the ‘all’ in both parts of that last sentence. It seems that no one has much trouble with the first ‘all’ meaning ‘all’. The second ‘all’ is where the trouble begins, because if it is the same ‘all’ then much of our theology bites the dust. So we have made ‘in Christ’ conditional, in a way that we do not with ‘in Adam’: so that only those who are ‘in Christ’ will be made alive. And we have gone on to define what being ‘in Christ’ looks like, according to our various denominations and streams. Both mentions of ‘all’ are the same ‘all’. Christ was the last Adam and the Adamic race ended with Him. From this side of the cross, no one is descended from Adam any more but from Christ. From that point on, all are ‘in Christ’ (though some do not know it and the ‘gospel’ we have preached has consistently told them that they aren’t). And Paul says that ‘in Christ’ all of us are going to be made alive. The sting of death is sin, and the power of sin is the law; but thanks be to God, who gives us the victory through our Lord Jesus Christ (1 Cor 15:56). For the law of the Spirit of life in Christ Jesus has set you free from the law of sin and of death (Rom 8:2). Those are very familiar scriptures and we read them as if they apply exclusively to ‘us’ (those we consider as being ‘in Christ’). But who is under the law, since the cross? No one, not even the Jewish people who were the ONLY ones under the law in the first place! Everyone has victory over death and sin through the power of the cross. …who has saved us and called us with a holy calling, not according to our works, but according to His own purpose and grace which was granted us in Christ Jesus from all eternity [literally, from before the times of the ages] but now has been revealed by the appearing of our Saviour Christ Jesus, who abolished death and brought life and immortality to light through the gospel (2 Tim 1:9-10). Death is abolished. It no longer has power over anyone. This was already decided ‘from before the times of the ages’ but has been ‘brought to light’ by the gospel. God is not holding anything related to sin against the world and is restoring all things, first to original condition and then to His original intention. God is looking for all things to grow and mature from their original condition to fulfil their potential, His original intention. Original condition is just the start: there is more to come! Background for header meme by Gerd Altmann from Pixabay. Let’s celebrate God! He lavished every blessing heaven has upon us in Christ! He associated us in Christ before the fall of the world! Jesus is God’s mind made up about us! He always knew in his love that he would present us again face-to-face before him in blameless innocence. God found us in Christ before he lost us in Adam! “And behold, I am sending forth the promise of My Father upon you; but you are to stay in the city until you are clothed with power from on high” (Luke 24:49). Jesus was talking about the coming Pentecost and the first step of the Holy Spirit leading us into ‘the freedom of the glory of the children of God’, re-clothing us with the glory Adam and Eve displayed. That was to be the beginning of the process and our transformation was intended to continue, but many have become stuck or even refused to go there! We must embrace that truth, and the reality of spiritual gifts, but see it as just one step along the road to fully restored sonship and the authority that goes with it. For thus says the Lord of hosts, ‘Once more in a little while, I am going to shake the heavens and the earth, the sea also and the dry land. I will shake all the nations; and they will come with the wealth of all nations, and I will fill this house with glory,’ says the Lord of hosts. ‘The latter glory of this house will be greater than the former,’ says the Lord of hosts, ‘and in this place I will give peace,’ declares the Lord of hosts (Haggai 2:6-7, 9). For Israel, under the old covenant, the house they were expecting to be filled with glory was the Temple. And when Jesus came to the Temple, He came with the glory of God again. But He was rejected by the religious leaders and when He left the Temple for the last time (in Matthew chapters 23-24) He left it desolate, that is, without the glory. In the new covenant we understand that we are the house, and we are to be filled with glory. And His voice shook the earth then, but now He has promised, saying, “Yet once more I will shake not only the earth, but also the heaven.” This expression, “Yet once more,” denotes the removing of those things which can be shaken, as of created things, so that those things which cannot be shaken may remain. Therefore, since we receive a kingdom which cannot be shaken, let us show gratitude, by which we may offer to God an acceptable service with reverence and awe; for our God is a consuming fire (Heb 12:26-29). Our bodies are a house of God, and we are part of this ‘mountain of the house of the Lord’ which is being restored by fire. The fire of God is not something we need to be afraid of. His fire is His love, and it only consumes the worthless, temporary things we have created on our DIY pathway. His fire is necessary to restoration – we cannot restore anything by the self-help methods which compromised God’s original intent and purpose in the first place. When God displays His sons to the world, when we are fully restored to positions of sonship, raised up and seated in authority in the heavenly realms, people will be drawn to the glory they see restored in us. What will that look like? And He was transfigured before them; and His face shone like the sun, and His garments became as white as light. And behold, Moses and Elijah appeared to them, talking with Him (Matt 17:2-3). Moses represents the Law and Elijah the Prophets. Everything in the old covenant was there to honour Jesus as he appeared in the full blaze of the glory of sonship. If that happened to Jesus, it can happen to us. While he was still speaking, a bright cloud overshadowed them, and behold, a voice out of the cloud said, “This is My beloved Son, with whom I am well pleased; listen to Him!” (Matt 17:5). An extra phrase was added to the first time the Father affirmed Jesus as His Son: now He is saying “listen to Him!” So when we know our position, when God speaks that affirmation over us, creation will know to listen to us. Creation is looking for the revealing of the sons of God; it will listen and respond to us when we stand in that restored place of authority. At various times in history, God has given a few people mystic glimpses of mankind’s original state and of His original intention for us. In 1820, Anne Catherine Emmerich had an extensive and very vivid personal revelation in which she described Adam and Eve as clothed in light. Such testimonies are designed to motivate us to pursue our restoration in light, not to settle for less than God intended and to reconnect with the eternity that has been placed in our hearts. Hebrew tradition and many rabbinical writings talk about the loss of innocence and glory in terms of light being removed. My own encounters with light and talking to Adam revealed the same truth. 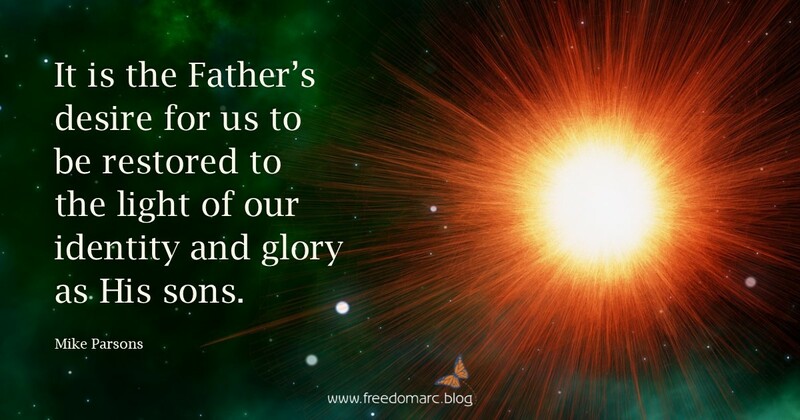 It is the Father’s desire for us to be restored to the light of our identity and glory as His sons. The more we realise and – in relationship – get to know the truth of who we are, the more we will begin to shine. 1 The Life of Jesus Christ and Biblical Revelations, vol 1 – Anne Catherine Emmerich, quoted in Frank Rega’s blog post referenced below. 3 The Nakedness and the Clothing of Adam and Eve – Jeffrey M. Bradshaw. Sorry! The Restoration of All Things intensive is now sold out but until the event you can still join the waiting list (in case of cancellations) or the same link will take you to the recordings later! Knowing that God is our Father is one thing; choosing to pursue that relationship and allowing Him to father us is something else altogether. His desire is that we share His heart; that we get to know His ways as well as His works. As we carry His heart and grow in maturity, He will include us in the deliberations of the councils and assemblies of heaven. His deepest desire is for His children to return to the place of our conception within the recesses of His heart, so that we can truly know Him and have a deeper revelation of who we are as His sons, made in His image: co-heirs and co-creators. 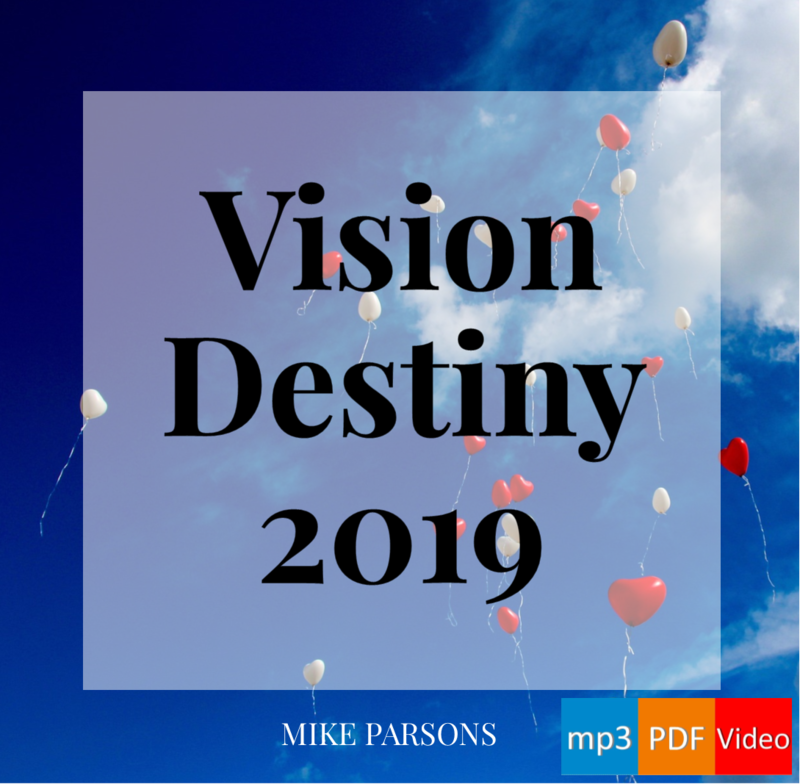 He desires to restore everything about us, including our identity, position, authority, abilities, knowledge, wisdom, relationship and connection to the created order. He desires to remove the limitations of the finite and the mortal nature of our minds and restore the limitlessness of our transcendent and infinite origins. We are relational beings, made in His image, of limitless creative potential. If I can imagine those things, then the true potential of restored sonship lies far, far beyond them. That shalom, that wholeness and peace, will carry on expanding: there will never be an end to its increase within His ever-increasing kingdom. And we are intended to be instrumental in the government of that kingdom. The restoration of our relationship as sons must lead to our exercising responsibility commensurate with our sonship. We will learn to rule, not only over what is already created but over what we create. We already have the ability to create; however, because of lost identity we have created mainly chaos. Knowing our identity and restored to sonship, our capacity to create beauty and order will increasingly manifest around us. The restoration of the sons of God will be like Joseph coming out of the dungeon prison to take up the second highest position in Egypt; we will emerge from obscurity and shame to be invested, enthroned, seated in the heavenly places; ruling and reigning as the mountain of the house of the Lord. As I ponder where my journey began, I remember as a child dreaming of adventures, quests and exploits of derring-do, and being drawn to films and TV programmes like Robinson Crusoe, Thunderbirds, Stingray, Lawrence of Arabia, Forbidden Planet and Lost in Space. My first book was H.G. Wells’ The Time Machine, which resonated with the destiny God had agreed with my spirit in the before. That destiny was buried deep within my soul, hidden, but creating that splinter within my mind which sought to break free of the limitations of my mundane existence. I longed to go beyond the small Cornish town that framed my life but films and dreams were my only avenue. God had wired me to be inquisitive, always curious about how things were made and how they worked. I often took things apart and, to my mother’s dismay, was unable to reassemble them. I loved to try to fix things that were broken, using my inbuilt ingenuity to solve problems with whatever was at my disposal. I often went on adventures, sometimes with my friends but mostly on my own, and would come back with some treasure – usually a creature that I had captured to be added to my personal zoo. Throughout my life, I have resonated with the mind-expanding possibilities of science fiction, Star Wars, Star Trek, the Marvel superhero universe comics and, more recently, films. I was stirred by the adventures of Bilbo Baggins in The Hobbit as it was read to us in junior school and later as I explored the world of Middle-earth in the Lord of the Rings trilogy. God had placed within my soul the desire for adventure that longed to be outworked but only began to find expression when I discovered that I was included in God’s cosmic plan for the restoration of all things. That deep-seated inspirational drive was at the heart of my quest for knowledge and a reality that always seemed just beyond my grasp. There was always something at the core of my being that knew there had to be more than this. “I still haven’t found what I’m looking for” are the lyrics of a U2 song that I resonated with for most of my life. When I first saw the movie The Matrix I discovered that the false and fabricated reality of religion had been pulled over my eyes. I was inspired to find the truth that had been obscured by the religious veil and willing to pay whatever the cost to discover what I had always known but had never been able to see. Thus began the quest for true reality, to discover what my destiny had always been looking for. In My Journey Beyond Beyond Mike shares about the restoration of a Father and son relationship, hearing the voice of God, seeing and travelling in the spirit; he explains how he began exploring supernatural dimensions to access the heavenlies, engaging with the angelic realms and legislating in the courts and assemblies of heaven. He tells his experience of integrating soul and spirit, deconstructing and renewing the mind, expanding consciousness and searching for quantum reality. My Journey Beyond Beyond is available from online booksellers and high street bookstores worldwide. Click here to find it on your local Amazon site. 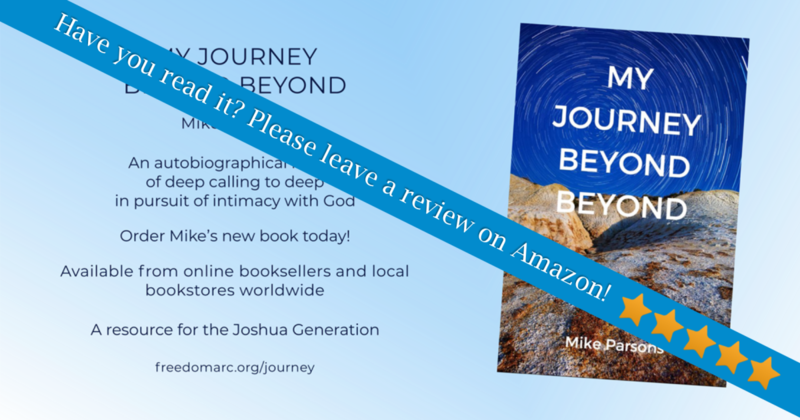 If that link does not work for you, please search ‘My Journey Beyond Beyond’ on your chosen retailer’s website. When we behold God face to face it can lead us to experience metanoia (a radical shift of thinking), removing the veils and renewing our minds. In the last post I described how my introduction to the mind of God was like a conversation: communion, fellowship and oneness between God the One as Three and the Three as One. One time the Father said “Come, walk with Me”, and we were walking in His garden. We were in a place of total rest, the most beautiful, living, vibrant place I had ever seen, felt, smelled or engaged with. Then it changed before my eyes into something completely different in colour, form and fragrance. And then it totally changed again. He said “Look through My eyes” and for just a moment I glimpsed all the infinite possibilities which exist all at once and I felt His pleasure and enjoyment in it all. It was like a mind-expanding trip to prepare me for what was to come. This time everything was dimly lit and it took time for my eyes to adjust. There were light pathways crossing and connecting but it was as if the power was down. He explained that we were walking in my own mind! We came to a gulf, and beyond it I could see doors that I somehow knew were closed but not locked. The Father said He would bridge the gulf for me, just this once. I saw a path extend across to one of the doors and knew the possibility of new pathways developing in my mind. I felt and sensed the potential possibilities of the eternal reality of who I was always intended to be as a son. Capacities that have been locked and hidden can now begin to reconnect. God wants us to be free from the limitations imposed by following Adam’s DIY tree.path. We walked across the light bridge He had made for me. I knew it was up to me to open the door, so I reached out with my mind. I embraced the possibility of opening that door to discover new dimensions of reality. The door opened and I just gazed with amazement at ‘now’; seeing beyond time and space, I could envision all the possible creative choices I could make at that moment. That was my first thought. It was a fear-based response, the fear of getting it wrong. Because I was walking with the Father as a son, heart to heart, I immediately felt that fear just melt away. I saw a golden thread intersecting my time streams, fixed at both ends but flexible and movable by my choices, and I realised that as a son and heir all my possible creative choices were good and acceptable and would all lead to positive outcomes. I saw beyond the boundaries and limitations of my consciousness disconnected from true reality. I saw that I could choose a possibility, that I could (in quantum language) “pop the qwiff” and collapse the possibility into a reality. I came out of this encounter and immediately I was faced with an opportunity to apply what I had just learned. I looked at my watch: it was 7.45am and I was due to meet Jeremy in my office at 8am. I saw the reality of being there on time and I chose to realise it and felt at peace. So I went upstairs and got ready to go out. When I came down and looked at the kitchen clock it was 7.55 but my watch (a Citizen Eco-Drive which never stops) still showed 7.45am. I decided to test this reality. So I went out into the garden to water the plants in my greenhouse and feed the fish. After all that, my watch was still at 7.45am. Just as I was about to leave, my wife Deb reminded me that she needed the car that morning. I was going to have to walk. It is not that far, it takes about 10-15 minutes, so I set off. It was still 7.45 by my watch. Halfway there I noticed it had started to move again and I got to the office at 7.55am. I saw the comparison. I saw the simplicity of the truth of the ‘now’ possibilities and compared it to the complex construct built from the interpretations of truth and reality that come from religion and culture. It was not lost on me that there were 9 of them. There are 9 fire stones, stones of revelation which Lucifer the light-bearer was intended to reflect. Those 9 stones became counterfeited and perverted as 9 veils that frame our minds. Each veil filters the light of God and distorts the image of God and His image in us. Each veil controls how our mind interprets the data we receive. The covering cherub’s role was to absorb and reflect the light released from the throne of God. He was responsible to release frequencies that would carry the image of God, revealing our sonship; but instead he chose the DIY path and led mankind down it too. The veils are mindsets established from beliefs that someone has taught us; revelation from old theological truth meant for a previous day, the resting place of words that frame our belief systems. There is a new revelation of truth for our day to discover. “But please do it one at a time!” I added quickly. As the pillars were ripped from my mind the constructs began to become unstable. It felt as if my mind was wobbling – like I was having a mindquake. The truth began to challenge my established and entrenched beliefs and my mind was being set free. I started to see things I was not able to see before and realised how many assumptions and presumptions I had been living according to. “The limitations are being removed and the realities are being expanded. Son, you are created and crafted with the creative nature of I AM as a son of God. 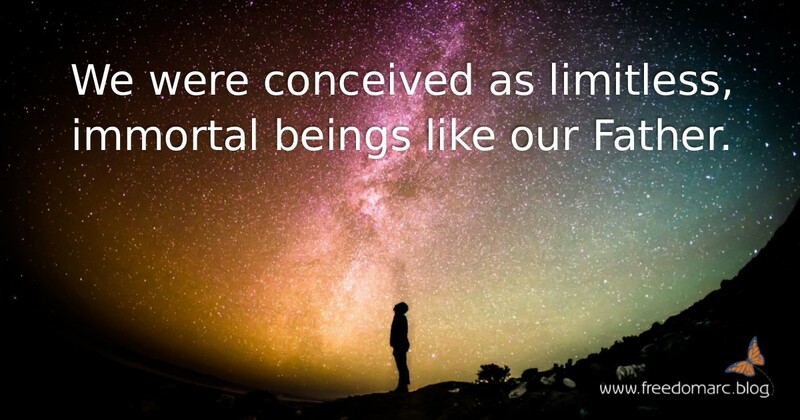 Your true potential is limitless but is controlled by the boundaries that exist within your consciousness. Rest in the deconstruction at the end of the 7th day to embrace the new beginnings of the 8th day reality. These things are beyond what we can imagine with our present knowledge and ways of thinking. By faith you too can open up your mind for Jesus to walk in it, to reveal the veils and constructs operating in you, and invite Him to remove the pillars. You may share some of the pillars my thinking was built on; you may not. Like me, you may want to say ‘Please do it one at a time’. But if you are to move on into the fullness of sonship, they are going to have to go.